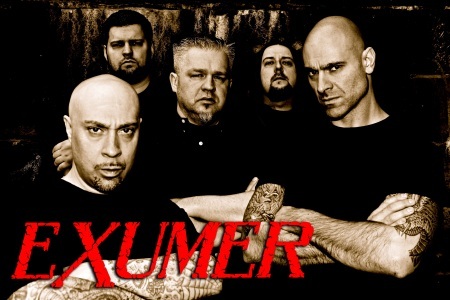 Originating on the cusp of the first Teutonic thrash wave, Exumer released two revered albums in the underground for Possessed by Fire (1986) and its follow-up Rising from the Sea in 1987. The band would break up by 1991 – reunite for a special festival show in 2001 – and then resurrect with vocalist Mem Von Stein and guitarist Ray Mensh by 2008, assembling a fresh lineup to release new albums and tour in Europe, North America, and South America. 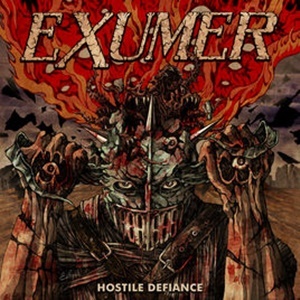 Hostile Defiance is the quintet’s fifth studio record – their first with producer Dennis Koehne solely at the helm (he’s worked with them previously in an engineering/mastering/mixing capacity), and illustrates the longevity of these musicians, their creativity, and passionate work ethic when it comes to their favored genre. Spitting meat and potatoes parts that contain equal vicious quotients as they do catchy hooks, the ten main tracks sit comfortably in that early Bay Area template with the occasional NWOBHM nod. Many will be able to pinpoint distinct influences, be it the Paul Baloff-ish delivery of Mem Von Stein or the shapeshifting razor guitar action from Ray Mensh and Marc Bräutigam that fuses together Exodus, Slayer, and Venom proclivities. 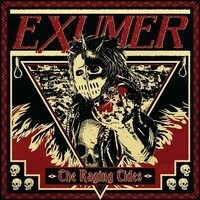 The barking command vocals for “Raptor” circles back to the days of Bonded by Blood, while “Vertical Violence” properly tantalizes through its crunchy riff charge and jumpy double kick backbone. When the band fire on speedy cylinders they can mow down any innocent bystanders as “Carnage Rider” will elevate adrenaline and blood flow, the lead break featuring shredding, dive bombs, and little melodic tidbits to keep the brain engaged. Much of the subject matter stems from Mem’s personal work background in psychiatry – tackling mental health and illness issues from oppositional defiance disorder to schizophrenia and hallucinations among others, offering fair assessments and perspectives that maybe aren’t shed in a proper context. Occasionally the band veer dangerously close to well-known riffs – “Dust Eater” for instance has a very distinct “Toxic Waltz”-vibe, which will assuredly send the patrons into a pit frenzy. Those who choose to get the special edition will also be psyched to hear some Exumer takes on “He’s a Woman- She’s a Man” by the Scorpions and “Supposed to Rot” from Entombed. Considering the band release records every three to four years at this point, Hostile Defiance achieves its goal of sending their followers into a flurry, a solid set of mid-tempo to slightly faster thrash with more of an old-school crunchy Bay Area polish to the proceedings. They’ve definitely come a long ways away from the raw, youthful spirit of Possessed by Fire.